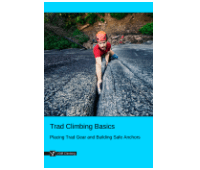 This 'How To Abseil' article is part of the e-book - Trad Climbing Basics. 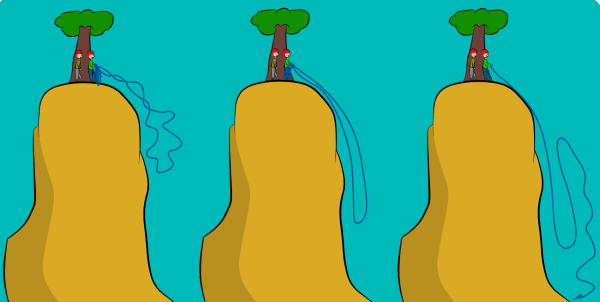 Abseiling (or rappelling) is a simple method of descending ropes that gets you back to the ground quickly. You can walk down from the top of many climbs, but if that isn't an option, you'll have to abseil. 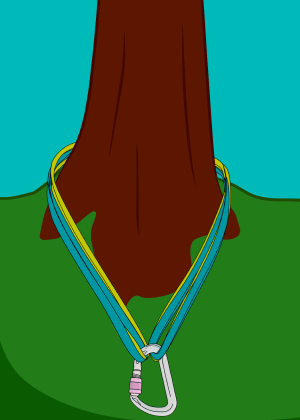 In most situations, there will be a fixed abseil point (such as two equalized bolts or some slings around a tree). You will trust your life to this, so be prepared to replace it if you need to. Next, you’ll need to attach yourself to it.  A common way of doing this is to girth-hitch a short sling through your belay loop and clip it to the anchor with a screwgate. 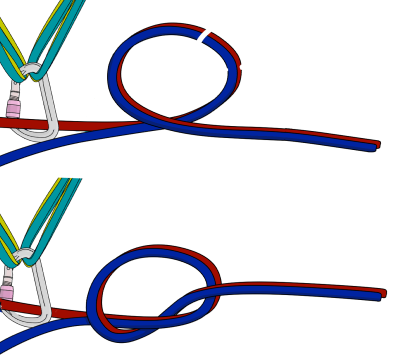 To be extra safe, use two slings with separate screwgates. This is especially useful on bolted abseil anchors where the two bolts aren't joined together - you can attach one sling to each bolt. Make sure not to climb above the anchor when attached only with a sling. High forces are generated if you 'static' fall (without a rope in the system) the full length of your sling which may damage or break it. Learn more. You can abseil with either one rope or two. Whichever you use, you'll need to get the middle of your total length of rope onto the anchor. 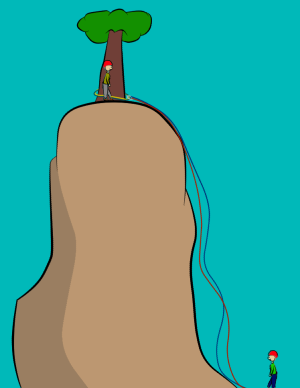 If you're using one rope to abseil, feed one end through the abseil point. Then holding both rope ends together, pull the ropes through until the mid-point of the rope is at the abseil point. Some ropes have a 'middle marker' to make this easier. If you are using two ropes, you'll need to tie them together. 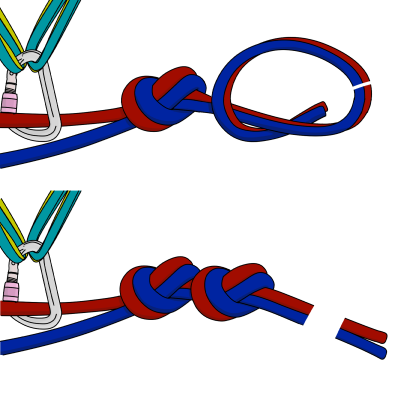 A simple and safe way to do this is to use the overhand knot described below. Thread the end of one rope through the anchor. Then hold one end of each rope together and make a loop at least 60cm from the end. Put the ends through the loop to make an overhand knot. Pull each strand of rope very tight on either side of the knot, making sure the knot is neat. Back it up with another overhand knot immediately next to it. Pull that tight too. You should have at least 30cm of rope left after the knots. You should throw your ropes down in a way that they are unlikely to get tangled together or stuck on something. 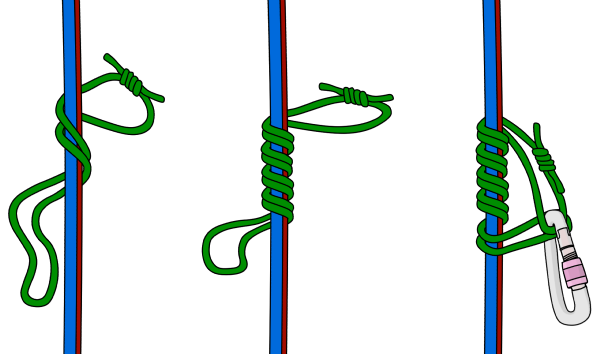 The following is a simple method of reducing your chances of a stuck rope. 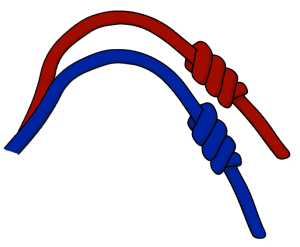 Tie knots (such as the triple barrel or overhand) in the bottom end of both strands of rope. This stops you from accidentally abseiling off the end. Prepare to throw the ropes down. It's better to do this one rope at a time. 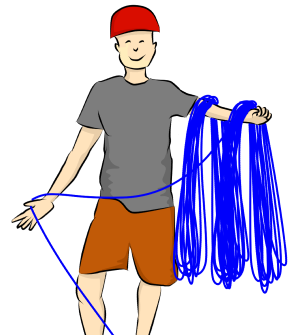 Starting from the end, stack one rope in coils over your arm. Shout ‘rope’ to anyone who may be in the area below. When you are certain that no-one could get hit by your ropes, you can throw them. Take the first half of the coils in one hand and the second half in your other hand. 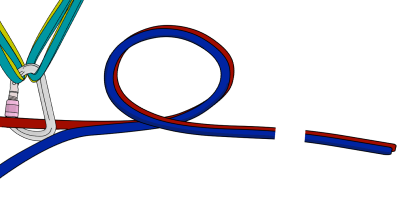 Throw the second half of the coils down, closely followed by the first. Stack the other rope and throw it down in the same way. Clip your belay device to your belay loop with a screwgate (don’t lock it yet). Pull up about a meter of both strands of rope. It will be heavy, so have your partner hold the rope up, or step on it to create slack so it’s easier to clip in. Push the ropes through your belay device making sure it is orientated the correct way up. Clip both of the ropes and your belay device through the screwgate carabiner and fasten it. 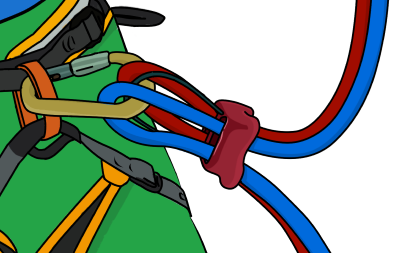 You don't need to remove the screwgate from your belay loop when doing this; you are more likely to drop it if you do. Lean into the anchor and pull any slack rope through your belay device. Then holding the ropes in the lock-off position, sit back and apply your weight to the belay device. This allows you to easily check the setup. For most abseils, it's wise to backup with a prusik knot. 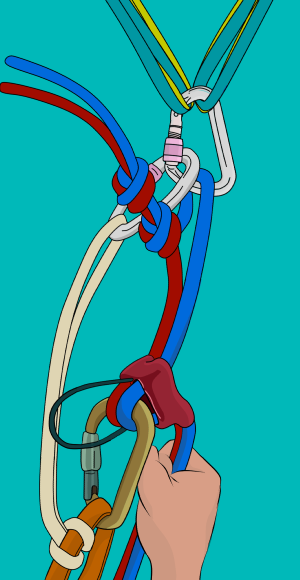 A correctly tied prusik will autolock if you let go of the ropes. Wrap the prusik around both ropes a few times and then clip the ends together with a screwgate carabiner. More wraps will create more friction around the ropes, though four wraps are generally enough. Pull the knot tight, make sure it is neat and the double fisherman’s knot is away from the ropes. Clip the prusik to your leg loop. The prusik will slide down the ropes if you hold it close to your leg loop and lock around the ropes if you let go. Test this before you abseil. If it doesn't lock, take it off and re-tie it with an extra wrap around the ropes. 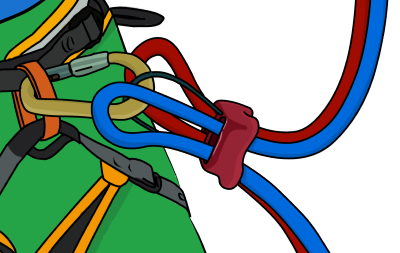 If your prusik loop is too long, it's possible that it could jam into your belay device during the abseil. If this happens, it can be difficult to control your descent. To avoid this, you can extend your belay device with a sling. With one hand holding both ropes in the lock-off position, unclip your sling from the anchor and clip it out of the way on the back of your harness. Put your second hand over the prusik.  Your hands should be in the same position as they would to lower a climber while belaying. While keeping a firm grip, lean your weight back and allow some rope to go through your belay device, remembering to slide the prusik down as you go. Continue feeding rope through as you lower yourself down. You'll soon be able to figure out how fast to feed the rope while staying in control. Sit back in your harness and keep your body in an L shape with your feet wide apart. Walk backwards down the rock, making sure to look behind to see where you're going. Move smoothly down the ropes. Don’t bounce, jump or swing around – this puts much more force on the anchor and is likely to damage your ropes if they pass over rough edges. 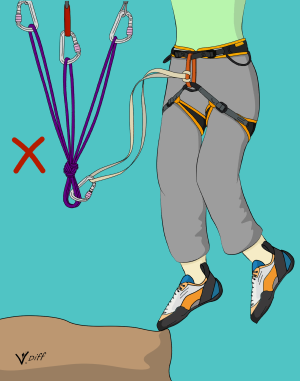 To abseil past a roof, plant your feet on the lip and lower your body down. Once your body is below the roof, cut your feet loose to avoid hitting your head. If you are the first in your group to abseil, you may have to deal with tangles of rope hung up on ledges, flakes or in bushes. Always deal with tangles when still above them. Lock off the rope with your prusik and pull the rope up to unfasten the tangle or flip the rope free of the snag. 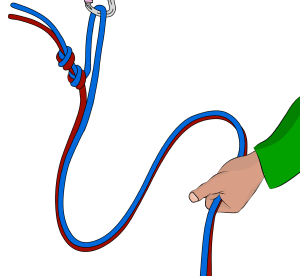 When you're safely attached to the next anchor (remember to inspect it first) or on the ground, remove your belay device and prusik and shout up to your partner that you're 'off rope', so they can begin abseiling. When everyone is down, you can retrieve the ropes. Unfasten the knots from the ends of the ropes and pull down on the rope that you didn't thread through the anchor. 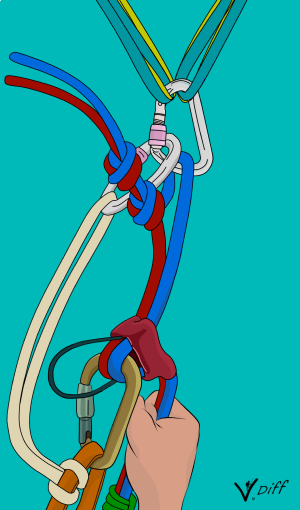 Keep an eye on the other rope as you do this to make sure it doesn't go up with a mysterious auto-knot fastened in it. When the ropes are about to fall down, shout ‘rope’ to warn your partner(s). Be aware that the falling rope may bring down loose rock with it. 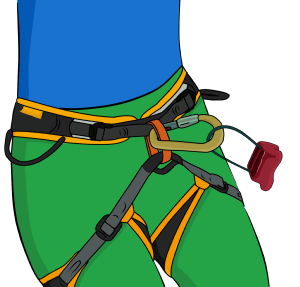 If a less experienced climber is worried they may not be able to control the abseil, they can be given a fireman’s belay. 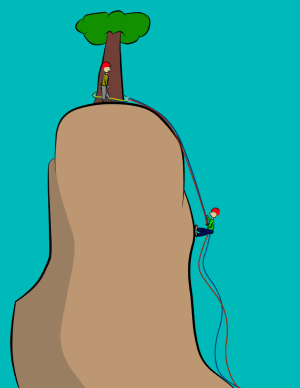 The more experienced climber descends first, then holds the ropes while the other climber descends. A simple pull on the ropes will lock their device. 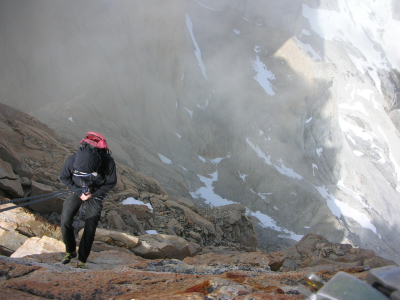 This is also useful if one climber has forgotten their prusik – they can abseil last with a fireman’s backup.